The recent discussion around CIE era modellers and the plough vans has been the subject of much debate here in IRM Towers. We have love for the roundel as much as anyone, but as sales and our customer survey a couple of years ago showed, the love seems to be for more modern era than CIE days. The debate started around our announcement of our plough vans, where we did announce the CIE version initially, but changed to IR and IE. There were two reasons for this; one as outlined above, and secondly, the CIE van requires additional tooling changes, including doors and removal of the mesh grills. However, there has been impassioned pleas for the van in CIE guise. So, we have looked at it again. We feel we can do it and add it to the order along with IR and IE vans. Firstly, we really need your support on this. We stand to make next to nothing on the ploughs, as they were more about finishing the ballast hopper train off than a money maker, but if we receive cancellations of IR and IE in favour of the CIE vans the whole project becomes unviable. So, we would need you to buy them and show your support for CIE, but we would really need you to not cancel your existing order if you have plumped for IR and/or IE. We know it’s an inconvenience, but we’ve crunched the numbers several times and it’s the only way we can do it. 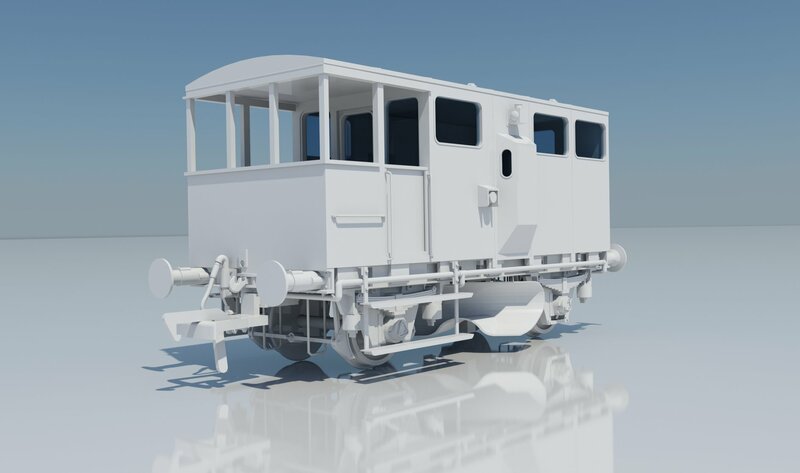 As an added incentive for the CIE plough, if sales do go well we are looking to do ballast wagons with the CIE roundel in 2019, so you can have an authentic CIE era ballast train. Perfect for your Supertrain 141, 181 or forthcoming 121. We know it’s an unusual approach, but this is a project where we really need your support for it to work. If the desire isn’t there, then we will just do IR and IE ploughs and conclude our market research and gut feeling was correct. Here is your chance to prove that wrong and act as a catalyst for CIE models to appear in the future. Let us know what you think below, and if the desire is there we will put them up for preorder very soon for delivery along with the IR and IE vans in late August. A big yes to the CIE vans and more ballast hoppers. If there were any existing packs left in stock I'd pick up about 3 more packs of the current era. I know its a labour of love but would love some more CIE stock. Have not ordered any vans yet as I was holding out in the hope of the CIE ones appearing. "A" good move for extra sales hope it works out .... It would be good to know from the experts on here how much crossover time for having both CIE and IR liveries possible in the same working. 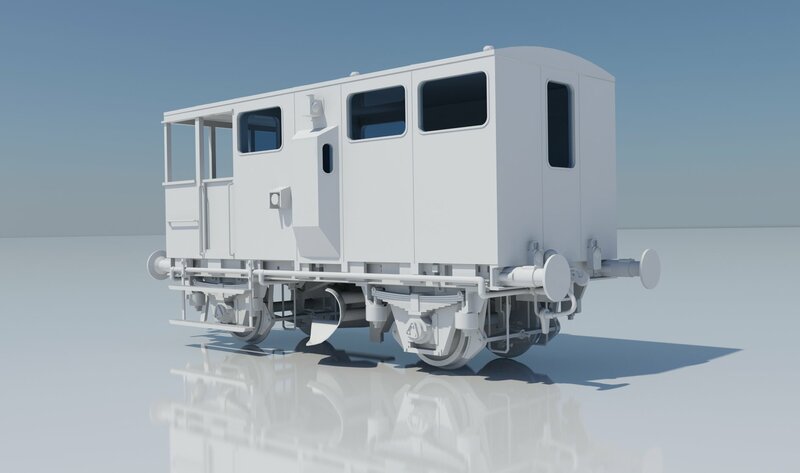 If you were going to produce more ballast wagons in CIE Era , could you do a run of Gypsum wagons at the same time ? It's under consideration, but I can't say any more than that at the moment as I'm sure you can appreciate! It would be great if we could keep focus of this topic on the CIE ballast plough for now, as we are a bit tight for time to give the factory the green light or not. If IRM were to release the CIE version, I would look to buy it, To be fair, I have purchased everything so far that is released. I for sure would not cancel my current other for both IR and IE, I am looking forward to the delivery of them. I would wonder how much it would cost that would be all considering the changes that have to be made. Thanks for the support! The cost is a significant sum to the tooling as these mounting points need to be invisible for the IR and IE variant, so extra tooling is required. I will be staying with the IR version already ordered and paid for. I am an early to mid 80s' man up to Mk 3 era so am really interested. Haven't ordered yet as was waiting to decide what to do so I will definitely buy 2 plough in CIE finish. Likewise with the Tara's I have held off. Not so much by the colour but by the roof. What's your query with the Tara roof? Ah I get you now. Yes, we will do the blue tara's with correct lid in the future! Would definitely buy the cie version as well, and would also like to see the cie ballasts to complete the line up. i personally think that no matter what ye lads produce with these standards it will be a winner. great work. 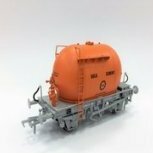 I really want to support IRM hence have bought the ballast wagon and the bubbles. Will definitely buy the CIE ploughs. Will be buying fert's, flats and anything else that comes along as long as it was around pre 1990. Will wait for the blue Tara's. I am not overly worried about paint colour as 90% of wagons should be heavily weathered to be in any way accurate. The principle cause of the weathering in the pre graffiti era was dust from the cast iron break shoes. My memory of the Tara's is that if one or two wagons in the train was blue, that was it. Hence the reason that Inchicore decide to paint everything brown in the mid eighties. The only wagons that were kept in any way clean were the ammonia's. Even these got very dirty, but because of the inspection regime, they were washed at regular intervals. We appreciate the support everyone, we really do. We know that there is a broad church of tastes out there, and we respect that. We will be catering for everyone as much as commercially possible and we dont expect everyone to buy every single model we make (though we really appreciate those that do and thank them for it!) it's just in this case we need that extra bit of support as it's such a short run bit of stock. It's not far off short run brass territory to be honest, and if that was the case the price would be prohibitive for most of us wanting to buy them! Personally, I am really appreciative that you have listened to modellers and have taken the bold move to consider a CIE era plough van; a niche modelling period for what was a niche model to produce to begin with, with only five examples ever in existence. Also, interesting to see the differing stencil types on your proposed livery drawing. As the period that I intend to model would be around 1980, I am firmly in the CIE era, so I would definitely have an interest in these, and maybe even two packs of them if you are considering a run of CIE ballast wagons too. I would be interested to see what other plough vans carried identical stencilling to your drawing to allow for possible renumbering if buying two packs. Like everything else, there are plenty of tyre kickers in the railway modelling world, so I think the only way that you will get an accurate reflection of interest is to open an order book, and if the cut off point for making this viable isn't reached, then it won't happen. I don't think anyone can ask for more than that. Anyway, many thanks for making the proposal to us modellers and hopefully there will be sufficient interest to make these vans in CIE livery a reality. I model the later era so I will stick with the IE version and look forward to all the other models that are coming down the tracks. I have bought everything ye have produced so fa r and will continue to support what can only be called a revolution in Irish modelling, paddy Murphy started it, but you lads are taking it to a whole new level. I want the IR and the IE already ordered, and now I want the CIE ploughs also. I sincerely hope that you get enough support to push ahead with the CIE, as it’s a great deal for us and a massive thanks from you to those who have supported you, in going ahead with a project that will yield little or no profit, just so all era’s can be catered for. Thanks lads!!! CIE wouldn't be my preferred era so I consider myself extremely lucky with the releases to date. When you look at the fantastic models now available thanks to the IRM lads you can see why anyone modelling the CIE period would want a piece of the action. These decisions have to make good business sense to be viable, that's just the way of the world unfortunately. Hopefully there's enough interest so the lads can crack on and get these produced for the CIE fans. I'll be sticking with my IE Ploughs which I have ordered and can't wait to get my hands on. I am astounded (and very happy) to see this thread. I had supposed that since the average age at IRM Towers is little lower than the average age of the 'typical' modeler that there might be a tendency to a more modern era in production. I purchased 24 ballasts, that remain unused in their boxes, (blasphemy, I know, sorry lads! ), not because I am attempted to emulate Wrenneire but principally because I wanted to do my part to get IRM off the ground and not have it fail at the first fence. I just prefer an older period to model, maybe to do with the stock that I remember from my youth in Ireland, although based on a lot of discussion on the site, even earlier periods into the 1950s also, a period that definitely predates me. I had at least intended to convert one rake of twelve ballasts to dolomites at some point. It's unfortunate that each run of wagons has to sell before another can be produced since the models are then no longer available for purchase to new modelers, or on view in a model shop to stimulate interest for potential new modelers. The production of new models in an earlier era may allow 'excess' models to recirculate to new modelers at reasonable cost on the secondary market, which is what would happen to mine if the option of CIE ballasts became available, I suspect. I haven't purchased any ploughs so far. Like iarnrod, I will VERY happily commit to a pair of CIE ploughs and a second set of ploughs from one of the eras to support this effort. Sincere thanks for trying to cater to your CIE era supporters. I would certainly go for a CIE pack.I have ordered a IR pack as well. Just reiterate. 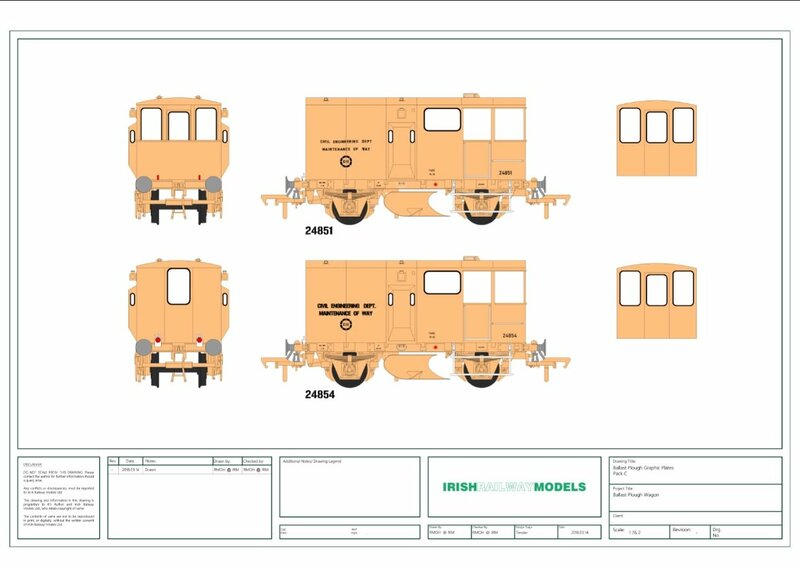 Even though my main period of Irish Rail modeling would be mainly from early 1980s up to the withdrawl of the Mk3s, it nicely covers a varied mix of CIE, IR and IE branded stock. I do have plenty of B&T BGMs to cover the 60s and 70s era too as I love the older setting even if well before my time. I have an IR and IE van pack ordered and if the CIE variation was put up now I'd order a set even if the CIE vans cost more than the current vans. I feel the vans are well worth it and great to have a RTR model of that quality even for the very limited market. Thanks for the feedback everyone, we will sit down and look at it again and see how it stacks up before making a call on it either way. We also welcome further feedback on this thread. It's a good bit of money at the end of the day, so we need to be absolutely sure as I'm sure you can all appreciate! This topic was touched on in the fertiliser wagon thread, buy you could say some modellers are holding off buying CIE orange bubbles as there is a degree of uncertainty as regards how many of the models in the future will cover the CIE era. Now I know this is a bit of a 'catch 22' situation for the IRM lads, and they obviously need to be sure that a model will selll and be viable financially before producing it. While some of the current proposed range will overlap into the CIE era, albeit maybe with incorrect buffers (still no decision as to larger buffers on fertiliser wagons), there is still a degree of uncertainty there for modellers of this period as to whether this period will be fully catered for, and I'm guessing, although it might sound a bit contradictory, that this is maybe preventing sales of the orange bubbles. Also, the fact that the orange bubbles were introduced after it was initially said that they might be produced in the future and therefore some would have bought the ivory bubbles instead. I've been holding off on buying any orange ones until I get a more accurate idea of where the whole CIE area coverage in terms of models is going, and from the fertiliser thread, it seems that I'm not the only one. This is just an observation, and in no way an underhand dig at the IRM guys who's efforts so far have been amazing, but something that I feel does need to be considered when they make their decision as regards producing the plough van in CIE livery or not. Some interesting observations, but I'm not sure I agree with the assessment tbh. A few years ago there was no accurate CIE era stock, as there was no IR / IE stock. Now there are some, between us and another manufacturer, and people who are interested in that era are now holding off buying models pitched in that era? Sorry, I don't really understand that logic to be honest. The ivory bubbles were suitable for CIE era. Okay, the brake tests had more modern dates on them, but we use photos for all our models, so we go off what we have in the photos as there aint many clear detail pics out there, so surely some transfers or heavy weathering would take care of this issue if it really bothered a CIE era modeller? The 99% are happy to run those wagons behind their CIE era locos. I know it's not enough for some, but surely they would get the transfer sheets out? The market here is tiny, we try to cater for everyone but it's difficult to please everyone as we are seeing here. We have said we will make blue Taras, which are CIE era, we have made orange bubbles (we said we would produce them depending on interest of the ivory ones, which was fair enough, we were doing it in Richie's kitchen at the time! ), and ivory bubbles with CIE branding. The ferts will cater for CIE era as well as more modern era, and liners such as B&I containers are coming too. That, coupled to the ballast plough above and if we do press on with it, CIE branded ballast wagons too, is a serious commitment to the CIE era. I don't know how much more we can show our commitment to that era to be totally honest. At the end of the day, the likelihood of us making more orange bubbles is slim, same with ivory. at least in the next 7-10 years. If you got them when they were available, happy days. If not, it's a case of you snooze, you lose I'm afraid as demand by the many will have been satisfied and there wont be a enough demand for another run, despite the few who decided to wait. You can also bet that the price point will be higher. All valid points made, and it's great to be able to have a frank discussion with a manufacturer like is happening here. I guess for me the issue is that I want to model whatever period that gives me the most freight models from the period between 1980-1990. My preference is the CIE era around 1980, but if I thought the IR era will see more freight models produced, then I will go with that option. It's early days yet in terms of what freight models you have or intend to produce, and at the moment, the later period is more fertile in terms of freight models available, so at the moment you could say that I am sitting on the fence here. Once I am back from holidays, I more than likely will invest in some orange bubbles, as once they are gone, they are gone, and it would be a shame to miss out on them. That's just an insight into where I'm coming from if that helps explain things a bit better. Like I said, to be even able to have this discussion with a manufacturer sets you guys apart from pretty much all other manufacturers and that's really appreciated to see you take modellers opinions on board. Obviously though, at the end of the day, each model has to be a sound business decision for you guys, and I do totally understand and appreciate that. Thanks Noel. As we have always said, the best form of communication to us about a popular item or era is the sales figures. So if they sell, we will make more. Simple as that. As for people on holiday, we will leave it open a few more days, but we are coming to crunch time if we want to get this produced and delivered on time. So, if you know a CIE guy who would be interested, send him a text, email, telegram, carrier pigeon etc etc.